Condolence: Barbara was a gem! Her enthusiasm for life and her commitment to making the world a better place made her a joy to be with! She was so determined to do what was right as her suit against the high school showed early on. Barb’s sense of humor was also a joy. On one snowy day visit, as we were leaving her home, I backed into and knocked over their mail box. She just jumped out of the car and put it right, teasing me about my driving. I feel so fortunate to have spent time with Barb! 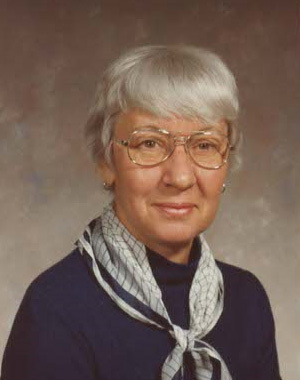 Condolence: I was privileged to get to know Barbara when I worked at Boise State's College of Education. Her wit and personality equaled her love of the teaching profession, and mainly the teachers themselves. Her directness was something I admired, even if it did make me blush a couple of times with some uncomfortable conversations. Condolence: We got to know Barbara and Bob when they moved in across the street from us in Hailey. They had such interesting stories, having traveled all over skiing, biking and hiking. I was especially proud of Barbara when she told us she sued the Blaine County School District when they selected a male as principal who did not have the qualifications she had. Barbara won, displaying the grit she had throughout her life. 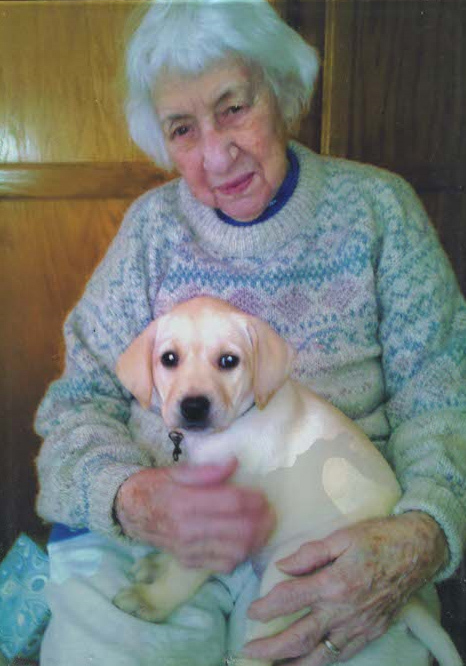 Barbara would say, "I take care of the Eder's dogs and they take care of me". 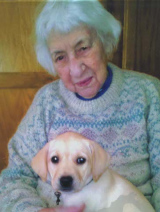 I love this picture of Barbara with our second lab, Latte. When our first yellow lab Nala was just new, I left her out on the back deck in a play pen when I went to work. I had asked Barbara if she could go check on her mid-morning. Well, of course little Nala was yipping up a storm, so lonely. Barbara buddled her up and brought her over to their house. She took care of Nala everyday after that while we were working. When we got Latte, I didn't think Barbara would be interested in taking care of another dog since she was getting up there in years. I brought Latte over to meet Barbara right after we brought her home. After that, Latte went to "Doggie Day Care" at Barbara's most of the time. We witnessed the years taking their toll on Barbara, but she was strong willed and wanted to be self-sufficient. We were her "life alert" neighbors and were called over when she would try to get around and invariably take a tumble. She was a dedicated supporter of the causes she believed in and loved Boise State. Sometimes she would come over to watch the games with us and share holiday meals. She helped our son Jason with his reading after school when he needed some extra help. Barbara had a life well-lived and we will always remember her kindness. At the end of one's life I believe that is the legacy she leaves; that she had an impact and made a difference in many ways. Condolence: It's thanksgiving. I am sitting here thinking of all the things I am grateful for. I just got back my 1976 Wood River Year book from my sister about a month ago. It's been stored in her garage, and it's been so many years that I couldn't even remember her name. But I had this high school counselor that had a huge impact on my life. I have thought about often over the years and thanked her out loud for everything she did for me. Barbara was the one person I had in my corner and she fought for me. So tonight I turn to page 50 of the year book to get the exact spelling of her name in an attempt to locate and thank her only to find her obituary. I was 16 and pregnant my junior year in high school. I didn't even really know her when she called me into her office. She told me that they would try to expel me from school, but she fought for me. Sixteen is too young to even fathom life's consequences. She loaded me up on classes my junior year so that I would only need 4 credits my senior year to graduate. She told me I could do a work study where I only have to report in on every on every other Friday. I completed my courses as a junior, married, moved away, needing 2 classes through correspondence to complete my high school diploma. Two classes is the max that you can apply earned credits toward your high school diploma. I gradutated with the class of 1979. She also counseled me on my interests to narrow down a path for future employment. I took her advice, earned my accounting degree earning a six figure income. I read her story tonight. Because of Barbara, I have skied the world. Just last year I biked through the South of France with the Bogus Basin ski club. I will always be grateful for everything Barbara did for me, and deeply saddened that I never got a chance to thank her in person for keeping my life from the outskirts of hope. My favorite expression is when a door closes and window opens. Barbara blew all the doors wide open. My condolences to Barbara's family.